Our Spring 2019 production was A Year With Frog And Toad. Performances will be at the Mason Community Players' Theatre42. Please visit our Tickets page to order tickets, once we get closer to the performance weekend. A hit on Broadway, A Year with Frog and Toad was nominated for three Tony Awards – including Best Musical. 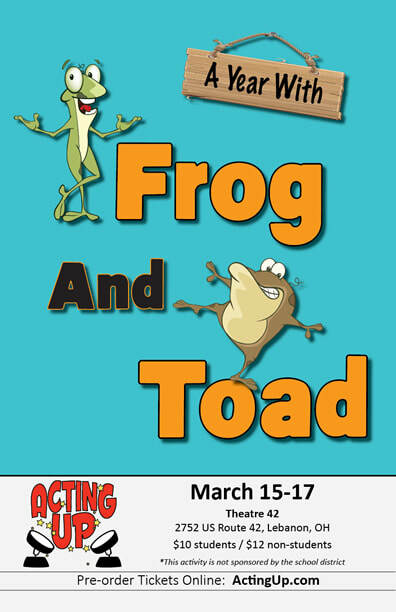 Based on Arnold Lobel's well-loved books, and featuring a hummable score by Robert and Willie Reale, this whimsical show follows two great friends – the cheerful, popular Frog and the rather grumpy Toad – through four fun-filled seasons. Waking from hibernation in the Spring, Frog and Toad plant gardens, swim, rake leaves, go sledding and learn life lessons along the way. The two best friends celebrate and rejoice in the differences that make them unique and special. Part vaudeville, part make believe... all charm, A Year with Frog and Toad tells the story of a friendship that endures throughout the seasons.